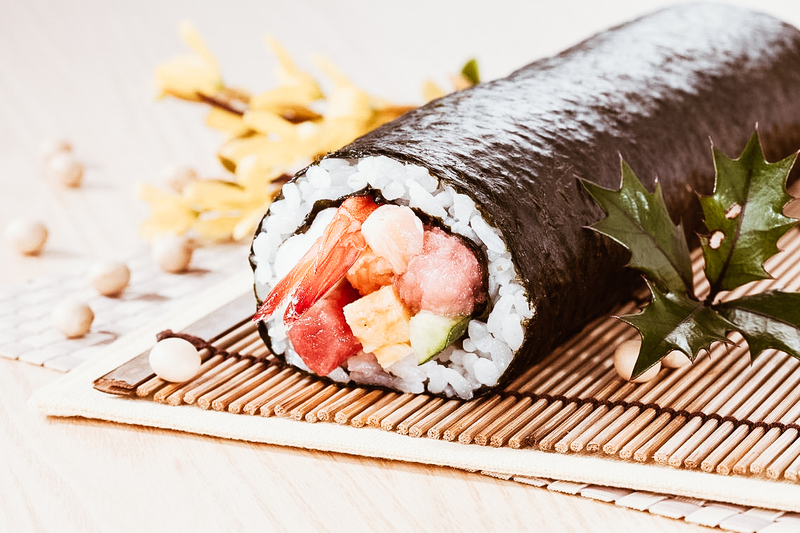 This season is celebrated in Japan with the haru matsuri (春祭, spring festival), a set of events whose beginning is marked by the occurrence of Setsubun (節 分). 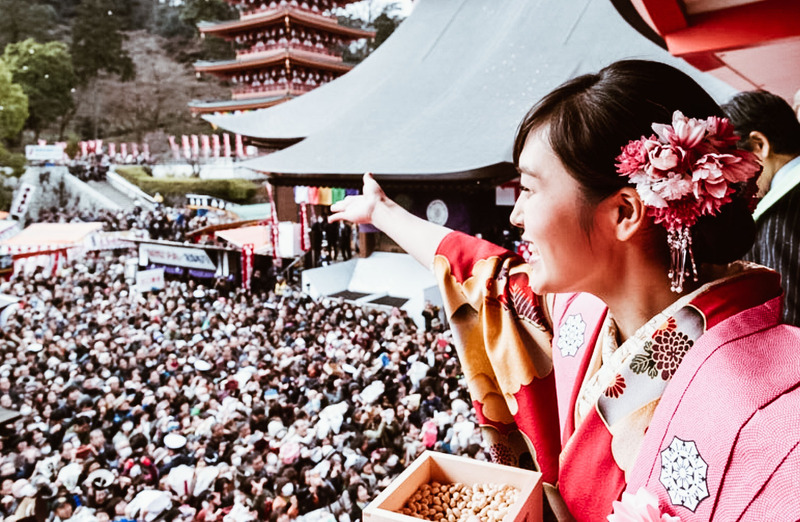 In the traditional Japanese lunisolar calendar, in fact, every change of season is introduced by a day called, indeed, setsubun (literally “division of the seasons”). Spring setsubun, which falls on 3 February, represents the last day of winter and the day before the start of the new season. It marks the transition from “Taikan” (大寒, big cold) to “Risshun” (立春, first day of spring) and is therefore the most favorable moment for a special “cleaning” from winter burdens, which will drive away evil spirits and favor the entrance of the new life-giving energy. This is the meaning of the traditional “demon expulsion” that takes place on this day through different rituals and customs. 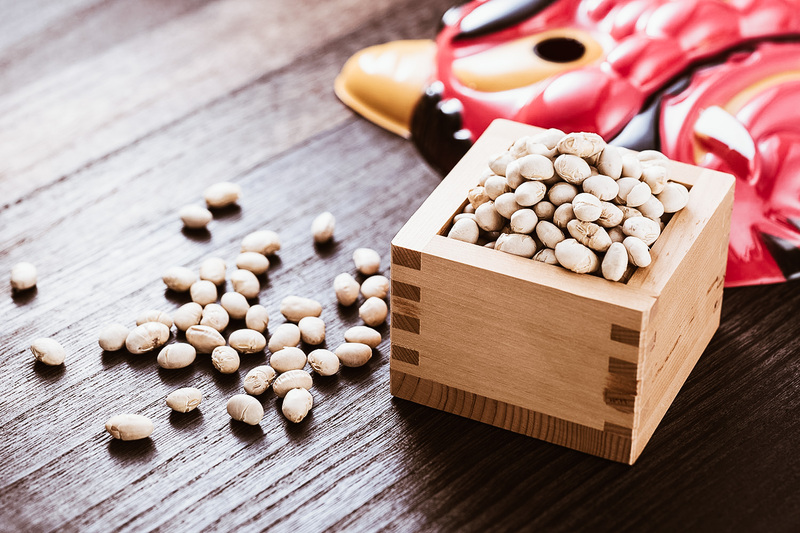 The most famous ritual is undoubtedly the mamemaki (豆 撒 き), which is the launch of soy beans. In the domestic sphere it is entrusted to Toshi Otoko (年 男, man of the year), that is the man of the family of the zodiacal sign of the lunar year entering or in his absence the oldest of the house. He has the task of driving out the harmful spirits and negativities from the house and the new year that is about to start by throwing around irimame (炒 り 豆, toasted soy beans) to the cry of “Oni wa soto! Fuku wa uchi! (鬼は外! 福は内, “Outside the demons! Inside fortune!”). In alternative, he can hurl the beans at another member of the family who plays the part of the demon wearing a mask of oni (Japanese folklore ogres). Subsequently, each member of the family must collect and eat a number of beans corresponding to their age plus one to ensure a year of success and good health (in the popular tradition, in fact, the demons are considered carriers of natural disasters and diseases). In both cases it is a tradition that has its roots in antiquity. 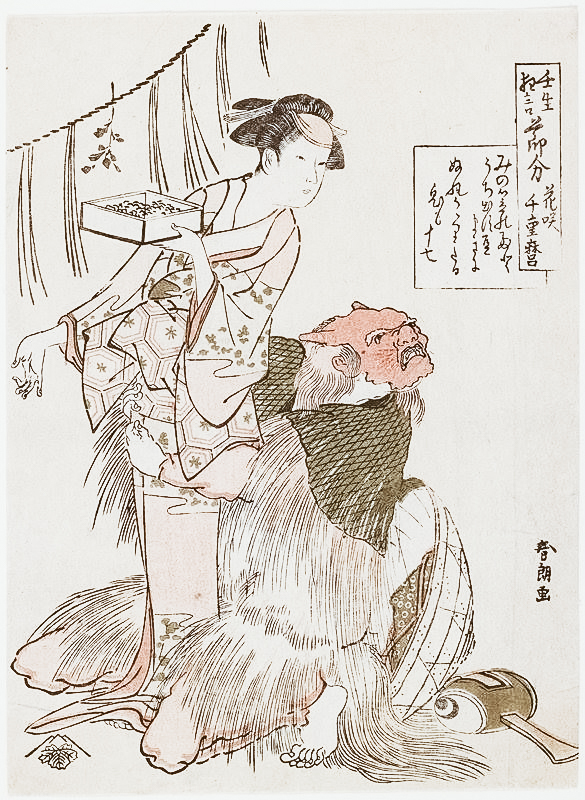 Nowadays it is possible to buy “Setsubun sets” – made of oni masks and roasted beans – in any combini, but in reality the mamemaki custom would have originated in the Muromachi period (1392-1573) and seems to be inspired to an ancient legend, whose plot is still represented in the form of pantomime in the temple of Mibu-dera in Kyoto. Here the kyogen (ancient Japanese theatrical form) titled “Setsubun” is repeated several times during the day and it is said that it is sufficient to watch it to be purified by any negative or evil spirit. Its plot follows the folk tale that tells of an ogre who, in human form, goes one day to visit a widow. Thanks to its magic hammer, the ogre makes a beautiful kimono, which attracts the widow’s attention. Eager to take possession not only of the kimono but also of the magic hammer, she decides to get him drunk to be able to steal them both. The ogre, however, aware of the theft, reveals his demonic nature and attacks the woman, who defends herself with the first thing that is within reach: a handful of soy beans. The oni, wounded but again in possession of his goods, flees leaving the widow safe and sound and perhaps a little wiser.